Blog›How to get started with Google Ads? How to get started with Google Ads? As Google gives more and more room for ads on their search results, it becomes increasingly important to get your search engine advertising on. Google Ads is a great tool that can give your products and services quick and relevant visibility while generating revenue. Create a Google Ads account. Select targeted keywords suitable for your business. Divide keywords to tightly themed ad groups. Choose relevant landing pages for your ads. Image: When creating a new campaign Google offers you to use their guidance and gives a lot of tips and instructions. Find a comprehensive guide by Google here. Below are few tips getting started with Google Ads and getting the highest possible return with Ads right from the beginning. Feeling unsure and even a bit intimidated by Googe Ads? No need. You don’t have to start with guns blazing. Initially, focus on what brings the biggest impact to your business. What is the product or service you want to sell the most? Where do you have best margins? What product or service has the biggest impact on your business now and in the future? Choose your keywords rather focusing on the quality of the traffic, not volume. You can start by looking for keywords from your own website. Try to reach the people in the very end of the purchase decision (“mobile phone” vs. “buy iPhone 6”). Build a solid, organized account structure right from the beginning. It is more efficient to both manage and scale your advertising later. Let your Google Ads account mirror your website structure. You can build a campaign for each category on your site. In addition, separate your most important products on their own campaigns, so you will have campaign level settings and better control over them. Always keep your search ads separated from the Google Display Network by choosing a campaign type “Search Network Only”. Search and display are very different types of advertising and better done separate. Image: Keep your campaigns organized in a way that they mirror your website structure. Google’s aim is to provide relevant results based on the search query. This is why people use their product - they find what they are looking for. Make sure the quality of your advertising lives up to that as Google rewards it by lower cost-per-clicks. Divide your keywords to tightly themed ad groups. You can have even just few keywords in each ad group. The smaller ad groups, the better. Avoid broad match keyword type in the beginning as it can quickly spend big portion of your budget and generate less-targeted traffic. You can read more about keyword matching options here. Write relevant ads to your ad groups. Use keywords in the ad text, highlight why visitors should buy from you and add call-to-action to your ads. Write two versions of your ads in each ad group. Here you can test for example which offers or call-to-actions perform better and use this knowledge further down the road. When someone clicks on your ad, make sure they find what they are looking for by directing them to the most relevant section on your website. Don’t force them to do search work again on your site - as they usually won’t. Image: The structure of an Google Ads advertisement. Use keywords in the header and remember to add an call-to-action. Data is the key of your optimization work and continued improvement. Truth is, nowadays customer funnels have become so shattered you can’t always get perfect data to back all decisions. But you can certainly get a decent amount of it and find patterns and trends you can apply to you optimization work. Google Ads' own reporting is sufficient, but with Analytics you can get great insights of your visitors. Make sure your Google Ads account is linked to your Google Analytics account. Find free, ready report templates from Google Analytics Solution Gallery for many different business purposes. You can find search terms that triggered your ads under Search Terms report. Add irrelevant search terms as negative keywords and find new keywords to add to your ad groups. Keep improving your keyword list. Remember that Google’s aim is also to make money with their advertising. Seeing a lot of budget lift recommendations? Bid increase suggestions? Automated keyword suggestions? Don’t blindly obey. Look into them, but it is up to you to evaluate how relevant these suggestions are to your business. Many companies already have enormous amounts of data at their disposal and collect even more with advertising campaigns. While collecting is fairly easy, the effective utilization is often problematic as they are spread out between different systems. To facilize utilization and create effective advertising campaigns all in one user interface we have enriched our solutions with Google Ads. The integration allows you to leverage multichannel marketing data and to create effective advertising campaigns all in one user interface. 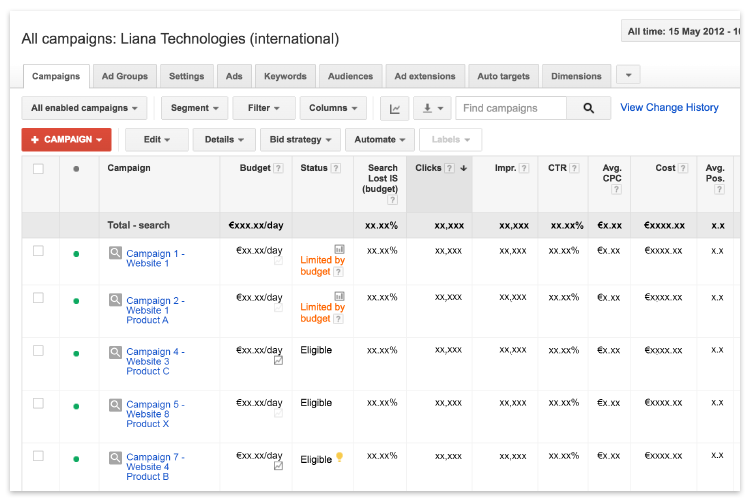 Image: Liana's Google Ad integration helps you to create and manage your campaigns. You can sink unlimited amount of hours in Google Ads (hey, there is always something to tweak) but keep your focus and work on the things that have the biggest impact on your business. Once your core business is covered, you can start to grow your account and test new things. It can temporarily take the sharpest edge from your ROI, but in the name of growth new things are certainly worth testing for. Feeling that you need a hand with getting started? Book a free consultation and see how to facilitate Search Engine Advertising with the right tools. This article was originally published on October 20th, 2016 and updated on August 27th, 2018. Thanks for sharing such a great, very informative and useful article to Ad Words campaign optimization tips.